On first sight, as we wait by the river for a ferry, there appear to be only a few rickety stalls where banana chips and cans of soda are sold to Peruvian tourists waiting in their cars to cross. But as soon as the vendors have determined the coast is clear, the scene quickly changes: two snakes are pulled out of a frayed rucksack. Three monkeys are removed from a cardboard box beneath a counter. A child walks past the line of cars, showing off a woolly monkey. All of these animals are for sale. Photo by Eline van Nes A baby Woolly monkey rescued from Tarapato, Peru. 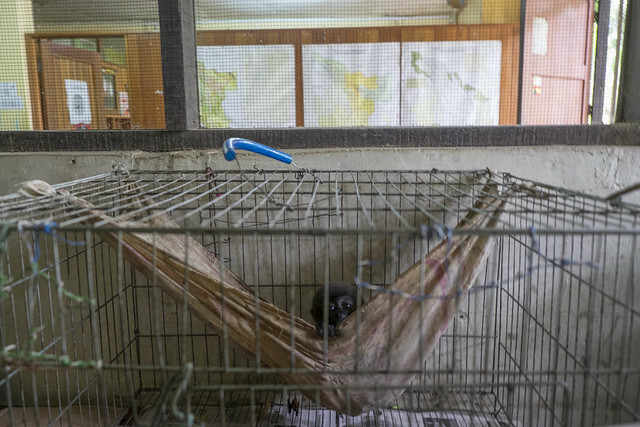 The illegal trade and imprisonment of exotic animals is not always visible in Peru. Many local people have learned that Westerners don’t usually like seeing monkeys and sloths bound and chained up. The animals, therefore, are not always shown to Western tourists. However, anyone inquiring at a market about a particular animal species is led through the corrugated-iron shacks to someone who has that animal. When the police arrive soon after, they arrest three of the children, and immediately the other vendors start complaining: The police shouldn’t take the animals from those sweet children. The children, meanwhile, are bawling their eyes out — sincerely most likely. They say they are worried about the beating they’ll get from their parents for having been arrested. Still, the other vendors believe the children also deserve to earn an income. The fact that they use endangered species, putting them at risk of extinction, doesn’t matter. For the local residents, poverty is the biggest issue. In Peru, the illegal trade in both plants and animals is pervasive. In one recent case regarding a smuggling network for illegal logging from the jungle, two police officers and two employees of the General Directorate of the Wildlife Flora and Fauna in Ucayali appear to have been involved in trafficking about $20 million worth of lumber. In other words, in that region the very officials charged with protecting the environment were involved in the dirty work themselves. Photo by Eline van Nes Children selling wild animals at a market in Tarapato, start crying when caught by a policeman. For the local residents, poverty is a more pressing issue than protecting endangered species. In 1975, Peru signed the Convention on International Trade in Endangered Species, or CITES, which mandates the protection of endangered animals. Violations are punishable by fines that can vary between from $12,000 to up to $1.2 million. But enforcement can be tricky. According to Alvarez, the fact that there are 20,000 people living in his village makes it difficult for him: He basically has to fine his neighbors. He is regularly confronted and harassed by residents who remain angry with him about such fines. This hesitation to enforce the law is a shame, says Israeli scientist Dr. Noga Shanee, whom we meet that week during the raids. According to a scientific paper she published in December 2015 in the American Journal of Primatology, every year around 100,000 primates are killed or captured in Peru, either to be sold on the markets as meat or to be put on display at resorts or in other tourist locations. Aside from monkeys, also hunted are exotic birds, sloths, and ocelots. A 15-year study released last year found that some 380 different species are illegally traded in Peru, roughly 9 percent of which are critically endangered. Tufted capuchin monkeys, like the one we confiscated by the lake, are one of these targeted species. The monkey we rescued had a drowsy, infected eye and several bald spots caused by stress, abuse, and a poor diet. Capuchin monkeys, like many primates, are incredibly intelligent. Research has shown they even understand the concept of trade; they have been documented negotiating with researchers over peanuts. And when capuchin monkeys are placed in a cage, they constantly search for weaknesses in its construction. 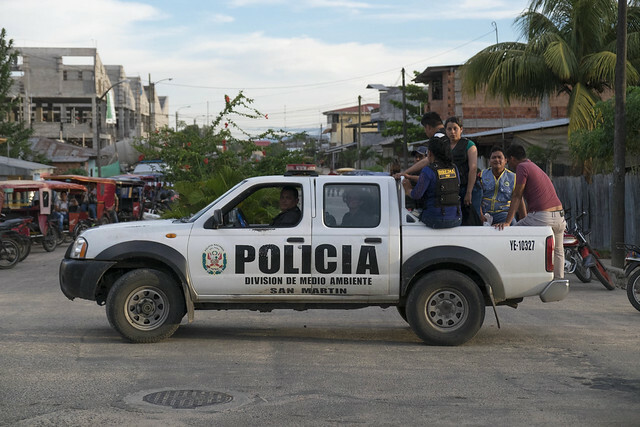 Alvarez says policing the illegal animal trade is not a high priority in Peru, a country struggling with cocaine trafficking, street crime, and corruption, and there are scant resources dedicated to that effort. The lack of resources for the police team presents a constant problem. For example, even though it is one of the most important means of transportation in the jungle, the police don’t have their own boat. To return from the Sauce Lake following the animal confiscations, they have to negotiate the price with the driver of a motorboat. Once they arrive at the police station, the sloth’s excrement is cleaned up using an old t-shirt. A rusty taxi is hailed to transport the confiscated monkeys, sloth, and turtle to the city center. The animals will eventually be taken to a rescue center. Photo by Eline van Nes Policing the illegal animal trade is not a high priority in a country struggling with cocaine trafficking. The sight of the hood of the cab, held together with rope, and the sloth dangling from a bent rod inside, would almost be comical were it not for the grim fact that the Amazon is the last large piece of continuous rainforest in the world, where animal species have been disappearing at an alarming rate for years. Local nature guides complain that their customers rarely see any live animals in the jungle. This emptiness is a world of difference from the jungle the Portuguese explorer Pedro Teixeira, the first European to travel up the Amazon River, described in the seventeenth century. “Never shall people here know what hunger means,” he wrote, in a reference to the abundance of wild animals around. The law in Peru permits Indigenous people to maintain their traditional lifestyle, including eating bushmeat — monkeys, tapirs, etc. It is legal for Indigenous Peruvians to hunt and serve monkey to their families. Taking the meat to the market and commercializing it, however, violates the law. Yet when government officials tell them they are not allowed to do so, local residents see that as interference in their personal lives: city dwellers are often considered by Indigenous communities as remnants of the former colonial power. 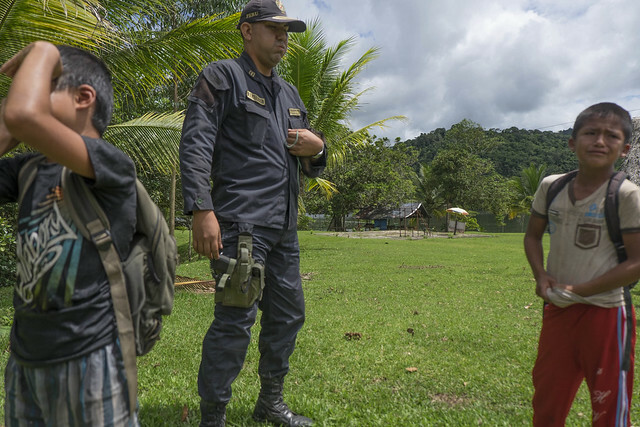 For those living in the jungle, the distinction between their traditions and the law can be unclear. In their villages, they live directly with the animals. They keep monkeys as pets like Westerners keep cats; the animals come to live with them because there is food. When rural residents move to cities like Tarapoto, they sometimes take their habits from the jungle with them. From its ministries in the capital city Lima, Peru is trying to combat wildlife trafficking with legislation: the law which permits heavy fining is a result of these efforts. The difficulty though, is to get people in the field to work with the limited resources they have. Unfortunately, the police team in Tarapoto is an exception to the rule.